You guys wanna get Rufus back, or what? NBC, which cancelled its Timeless TV show in the wake of an enormous season two finale cliffhanger, is bringing back the Lifeboat for one more trip through time. The Peacock Network announced today that it has ordered a two-part Timeless TV series finale, which is expected to air during the winter holidays. The #Clockblockers have prevailed against the malign forces of Rittenhouse, if in a smaller way than most had hoped. An NBC action-adventure series, Timeless stars Abigail Spencer, Matt Lanter, Malcolm Barrett, Goran Višnjić, Paterson Joseph, Sakina Jaffrey, and Claudia Doumit. As the Time Team, their mission is to prevent the destruction of the world as we know it, by villains intent upon messing with the timeline. Susanna Thompson, Annie Wersching, and Michael Rady recur in season two as members of the nemesis organization, Rittenhouse. 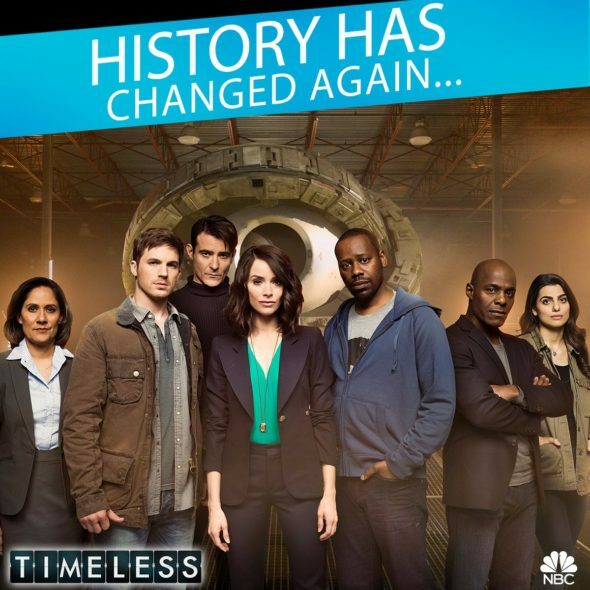 NBC officially cancelled Timeless last month. And that was the second cancellation. The time travel drama was also cancelled, then renewed following its first season on the network. Learn more about the Timeless two-part series finale, from this NBC press release. What do you think? Will you watch the Timeless TV series finale, this winter, on NBC? Will that be enough? Let us know, below. Of course I’ll watch and NO it isn’t enough. I want more. I can’t believe these really good shows get the ax and stupid ones continue to run. NOT FAIR. Yes I will be watching and NO this is not enough. First Grimm, now Timeless. Who is making all these wrong decisions!? I will definitely be watching the series finale and no that will not be enough!